Saab of Baltimore, established in spring of 1999, will embrace the Ask Patty concept. Saab of Baltimore, established in spring of 1999, will embrace the Ask Patty concept. Saab of Baltimore owes this distinction to their high level of customer service and outstanding reputation of total customer satisfaction. Saab of Baltimore Corp.'s partnership with Ask Patty represents an increased commitment to the female car buyer to provide a safe and comfortable buying experience. Saab of Baltimore has been providing Baltimore and the surrounding area the ability to experience the Saab automobile lineup. What began in '99 as a partnership of three dedicated Saab enthusiasts has developed into a business that as of the Fall of 2004 boasts one of the Auto Industries few woman Dealer Principals, Jenny Trostel. Saab of Baltimore has already made a commitment to great service and customer satisfaction to local women. Saab of Baltimore has been actively involved in the community and initially the dealership partnered with the local St. Vincent's Center and has an ongoing commitment to Maryland's Top 100 Women Program. Saab of Baltimore also consistently supports the United Way of Maryland, Boy Scouts of America, American Heart Association, and assorted youth sports leagues. "We are so pleased to be partnered with AskPatty.com," stated Jenny Trostel, President of Saab of Baltimore. "Giving women the opportunity to learn how to shop for a new or used car or receive quality repairs without feeling uncomfortable is very important to us. We have always felt that we offered a pleasant buying and service experience, but getting additional training continues to improve the overall experience at Saab of Baltimore." President Jenny Trostel's decision to partner with Ask Patty reflects the kind of forward thinking needed to deliver consistent outstanding results in customer satisfaction and sales growth to this important consumer segment. Jenny Trostel has also accepted a position as a member of Ask Patty's Advisory Panel of Automotive Expert Women and will be a great resource to the consumer women who are a part of the Ask Patty community. 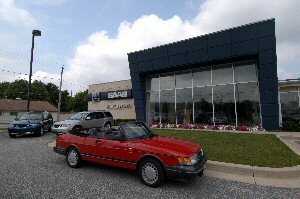 Visit Saab of Baltimore at http://www.askpatty.net/saabofbaltimore or contact our Ask Patty Sales Representative Brian at 888-581-7057.